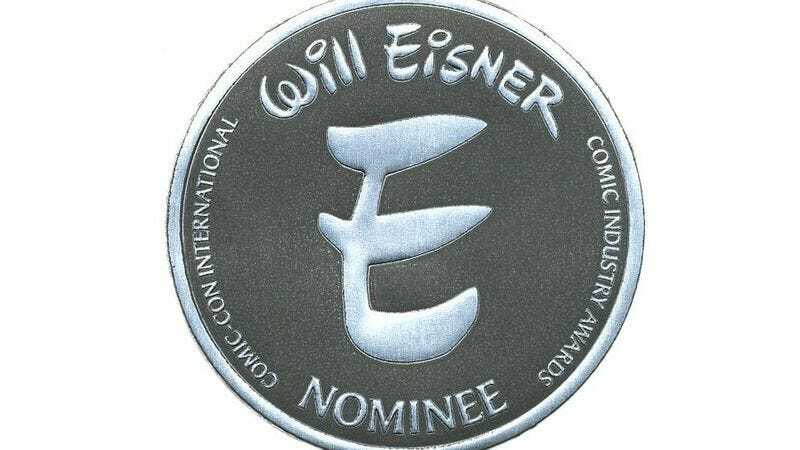 With the open acknowledgment that self-congratulation is unseemly and undignified, screw that, because congrats are nevertheless in order to ourselves—specifically our own Noel Murray and Oliver Sava, whose work on Comics Panel has just netted them a nomination for an Eisner Award, comicdom’s most prestigious honor. The complete list of this year’s nominees was just released, and amid the usual recognition for industry stalwarts like Ed Brubaker, James Kochalka, and Brian Michael Bendis, we were surprised and delighted to discover a nod to Noel and Oliver’s work under “Best Comics-Related Journalism”—a nod that is well-deserved indeed. Noel and Oliver will find out whether they won during a “gala awards ceremony” at this year’s Comic-Con. (And in the interest of “journalism,” I asked them what they planned to wear: Oliver says he’ll have on “a tux with a Spiderman suit underneath,” while Noel—who’s pretty sure he won't bother going—says that if he did he’d wear “my 1993 Comic-Con Love & Rockets T-shirt, because that's what I rep.”) But of course, around here they’re already Eisner winners, in the sense that they have already begun insisting we refer to them as “the Eisner-nominated Noel Murray and Oliver Sava,” even in casual conversation. You would do well to do the same.